I purchased a Chicco C6 umbrella stroller a few months ago for the purpose of having a lightweight, compactly collapsible stroller for travel and running quick errands around town. Overall it is a nice stroller, easy to push, very light-weight (11 lbs), has a slight recline feature, and comes with a travel bag and carry strap, which can be attached to the stroller or the bag. It seems quite durable, and my 16 month old son loves to sit in it. He gets excited when he sees the stroller and climbs right in. The one main negative aspect that I have found is that the handles are a bit low. I’m 5’5″ and when walking with this stroller for a while, my back begins to ache. It is certainly too low and uncomfortable for my husband to push (he’s 5’11”). Other cons are that I end up kicking the wheels when pushing the stroller and the shopping basket is quite small. 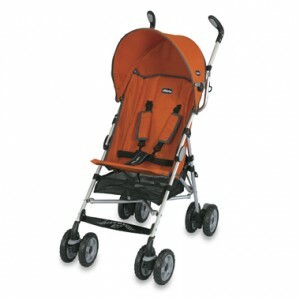 Overall it is a good stroller and well priced for a sturdy light weight category, however, after a few months I am considering trading it in for something with higher handles.